The owner of King’s Casino, Leon Tsoukernik yesterday won Event #16 of partypoker’s latest online POWERFEST series – the $5,200 buy-in Super High Roller for $207,978. It took over 11 hours for the entrepreneur to defeat a 204-strong field and overcome Mikita “helicopterben82” Badziakouski heads-up to claim the title and third Championship Event trophy of the three week-long festival. The September 2018 edition represents partypoker’s largest POWERFEST to date, guaranteeing $60m in total prize money across the course of the festival and over $20m in the third week alone. 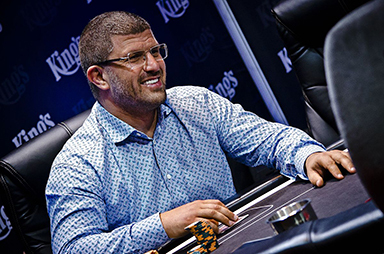 Known to partake in some of the biggest games anywhere, Tsoukernik is the owner of King’s Casino, a major casino partner of partypoker and the largest dedicated poker room in Europe. Located in Rozvadov on the Czech/German border, the popular King’s Casino has played host to a number of prestigious events in recent years, and in October 2018 the venue once again opens its doors to the partypoker LIVE-sponsored WSOPE following last year’s maiden collaboration. The 2017 edition saw a total €25m in prize money awarded as WSOP and King’s Casino came together for the first time to host Europe’s richest poker festival. Running from 9 October – 2 November 2018, WSOPE 2018 aims to build on the success of last year’s event, guaranteeing €13m across 10 official bracelet events as part of a packed schedule. On his POWERFEST victory, Tsoukernik said: “I only fired one bullet and am really delighted. I felt focused and in the zone the whole time. I saw that Patrick Leonard and Michael Zhang had deep runs and know how great they are as players. I’m just so happy, I love to play the best players, and it is so satisfying to survive in their company.